WHAT IS HAPPENING IN THE SCARBOROUGH, NORTH YORKSHIRE, AND U.K. SKY. The chart shows the whole sky, at the times given at the top left of the chart. The edge of the chart is the HORIZON, and the ZENITH is at the centre. This chart is for LATITUDE 54 degrees NORTH, and is produced using 'PLANETARIUM GOLD' software. As April begins, the Sun is in the constellation of Pisces, but crosses the border into Aries at around 07h00 the 19th. The Moon is at apogee, the furthest from the Earth, on April 1st at 00h, and again on the 28th and 18h00. Perigee, its nearest to the Earth, is at around 22h00 on the 16th. April’s New Moon is on the 5th at 08h51, in the constellation of Cetus, as it passes 5° south of the Sun. On the 12th at 19h06 the Moon is at First Quarter, in Gemini, beneath Castor and Pollux, and is one of the highest FQ moons of the year. Full Moonis on the 19th at 11h13 and may be seen in eastern Virgo, approaching the Libran border. This is the Paschal Full Moon, being the first Full Moon after the Vernal Equinox, as fixed by the Synod of Whitby in 664A.D. when the synod decided to follow the Western Christian Tradition. Last Quarter Moon is at 22h19 on the 26th in Capricornus. Look for Earthshine’s faint illumination of the night hemisphere at the time of the waxing crescent Moon on the 6th to the 11th, and the waning crescent on the last three days of the month. A final chance to see the evening cone of the Zodiacal Light occurs on fine evenings during the first six days of April, although increasing twilight as the month progresses, and the presence of the Moon begin to interfere. Its appearance is of a cone of pale light of less intensity than that of the Milky Way rising up from the western sky at an angle of 60° towards the south. It is caused by the Sun back-lighting the disc of fine particles surrounding the Sun in the inner solar system; all that remains of the accretion disc which formed the planets 4.5 million years ago. Although Mercury reaches greatest western elongation (28°) and the 11th, the planet’s low altitude in the eastern sky before sunrise, prevents the planet from being seen this month and for most of next month also. Venus may be observed for a brief period in the morning sky before the Sun rises. Binoculars will enable you to locate it in the very bright twilight of the eastern sky. If using binoculars, however, when scanning the eastern horizon for Venus, beware of the Sun rising; do not look at the Sun! Even a quick glimpse of it through binoculars can damage your eyes! Throughout April, Mars continues to climb in the western sky. At the beginning of the month it lies in the vicinity of the Pleiades (Seven Sisters) in Taurus. Mars has faded to magnitude +1.45 and so is slightly fainter than Aldebaran (mag. +0.9), the brightest star in Taurus, several degrees to the east (left) at the beginning of the month. On the 20th, Mars passes 7° to the north of Aldebaran, and you might like to try to see the slight colour contrast between the orange glow of Aldebaran and the slightly redder colour of Mars. Remember Mars is the fainter of the two objects. Look in the WNW at 21h on 20th. On the evening of the 8th, there is a pretty spectacle of the waxing crescent Moon with earthshine lying 8° below Mars. The planet shines at magnitude +1.5 on this day, and at the time lies midway between the Pleiades and Aldebaran in Taurus. During April Mars sets just before midnight all month. By the end of April Jupiter rises before astronomical midnight and so is visible in the morning sky before twilight hides the planet. Jupiter is to be found amongst the stars of southern Ophiuchus and when it culminates in the south just before 05h in the brightening twilight, it lies just 12° above the southern horizon. On the morning of the 23rd the waning gibbous Moon may be seen approaching Jupiter, and at 04h the Moon and Jupiter are separated by 4°, with Jupiter lying to the east of the Moon. Look for the Galilean moons through well-focused and firmly fixed binoculars as they change position night by night. During April, Saturn lies some 25° to the east of the much brighter Jupiter (magnitude -2.3), Saturn’s magnitude being +1.1. Saturn rises in the SE at around 03h as April begins, and two hours earlier by the month’s end. Although still at a low declination in the constellation of Sagittarius, the northern surface of the planet’s rings is a beautiful sight in a small telescope. On the morning of the 25th, the waning Moon almost at last quarter, may be seen approaching Saturn low in the southern sky in the brightening twilight, with Saturn lying 5° to the east of the gibbous Moon at the time. Saturn’s largest moon Titan is at greatest western elongation to Saturn, (approximately 2 mins. of arc) on the 6th and 22nd, and greatest eastern elongation on the 14th and 30th. Uranus, on the Aries/Pisces border, is in conjunction with the Sun on the 22nd, and so is not favourably placed for observation during April. Similarly, although Neptune in Aquarius, has returned to the early morning sky, it lies at an altitude unfavourable for observation in the bright twilight. Conditions are unfavourable for the Lyrids this year due to a bright waning gibbous Moon. 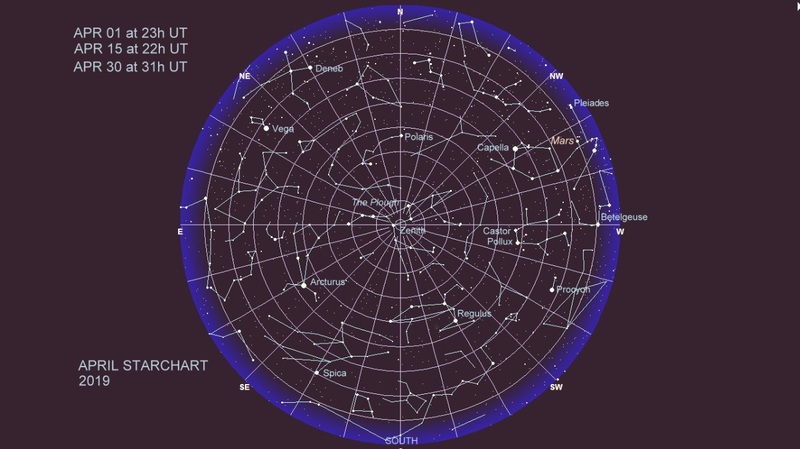 Look for Lyrids during the early mornings of the 22nd and the 23rd. The maximum number of meteors per hour is 15, and they seem to radiate from an area near Vega, the second brightest star in the northern sky. The Lyrid meteor shower is associated with Thatcher’s Comet discovered in 1861. Constellations visible in the south around midnight, mid-month, are as follows: The eastern part of Hydra, Corvus the Crow, Virgo, Boötes and Coma Berenices. The Plough, in the constellation of Ursa Major, is still near the zenith. All times are GMT 1° is one finger width at arm’s length. Times are given in UT for SCARBOROUGH (0° 25' 0" W, 54° 16' 3" N, zone 0 -UNIVERSAL TIME). SELECTED LUNAR OCCULTATIONS VISIBLE FROM SCARBOROUGH UK THIS MONTH.